Kittens ramble around in a wooden pen set up in Congress Square Park Wednesday. The pen had a window where passersby could stop, look and take photos. Visitors were asked to use the hashtag #kittensinCSP (for kittens in Congress Square Park) in social media posts. Theresa Klement (right) was in Congress Square Park Friday to see a group of kittens made available by the Animal Refuge League of Greater Portland for petting and play. Klement, who lives in a building adjacent to the downtown park, said she had two cats that passed away and is still debating getting a kitten. 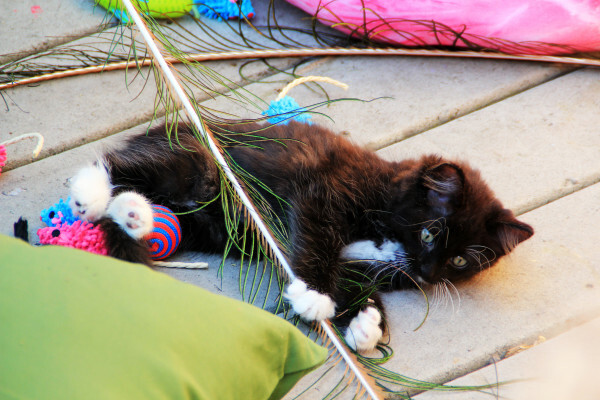 A kitten rests amid a group of cat toys. 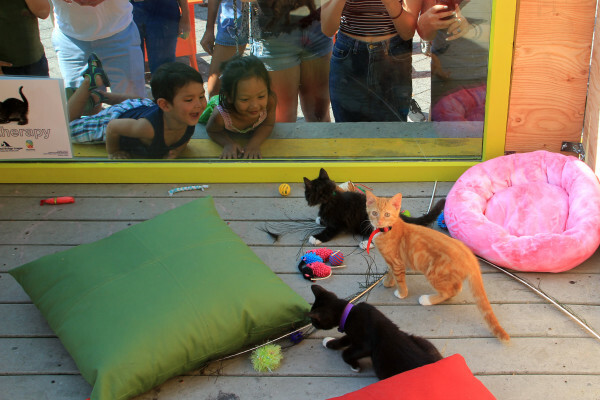 Five people were allowed into the kitten pen at a time. Those seeking entry took numbers and waited for them to be called, many standing by a window where passersby could stop, look and take photos. Portland residents Gillian Cook, left, and Audra Williams, right, snap photos of kittens early Wednesday during an event in Congress Square Park. Visitors were asked to use the hashtag #kittensinCSP (for kittens in Congress Square Park) in social media posts. 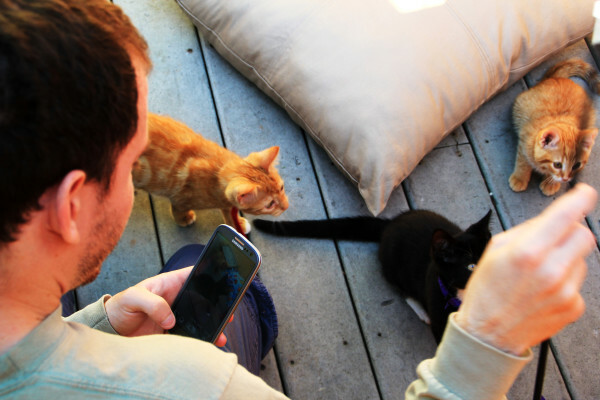 A visitor sets up a photo with some of the kittens-in-residence in Congress Square Park Wednesday. Visitors were asked to use the hashtag #kittensinCSP (for kittens in Congress Square Park) in social media posts. 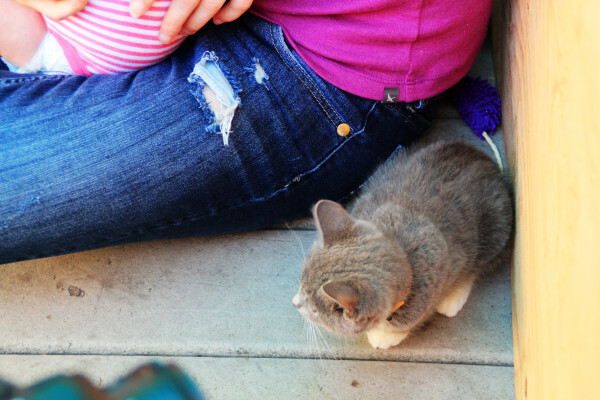 A kitten crouches in the corner of a small pen where the Animal Refuge League of Greater Portland and Friends of Congress Square Park arranged to let kittens loose for petting and play on Wednesday. PORTLAND, Maine — Kittens long ago took over calendars and the Internet. On Wednesday, they took over Congress Square Park. 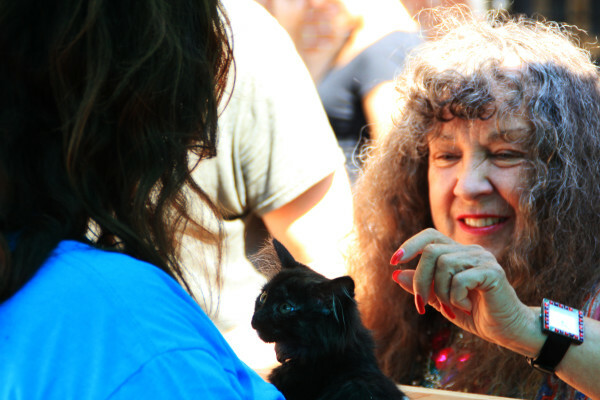 The Animal Refuge League of Greater Portland and the Friends of Congress Square Park set up the “Kitten Therapy” event partly for fun, partly for raising awareness about adoption programs and entirely for the joy of kittens. 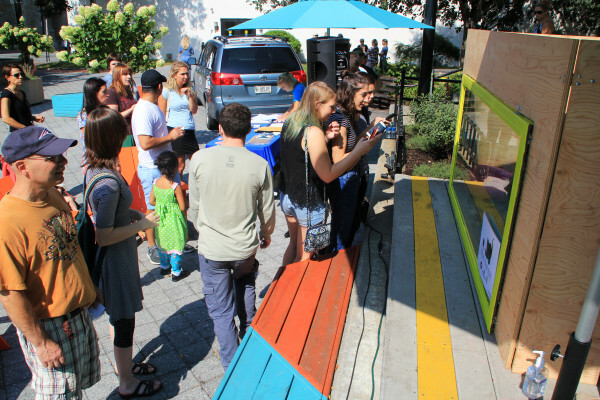 Hannigan lives adjacent to the park and spent the better part of the morning filling out numbers for an ever-growing line of people waiting for their turn in the wooden kitten petting pen. She had a feeling the draw to the event was more than just cuteness. “Cats are just like Portlanders — fiercely independent,” Hannigan said. That was evident to Theresa Klement, who lives in the same building as Hannigan, right next to the park. She took a turn in the petting pen. “I liked it in there, but I picked up a kitten that didn’t want to be picked up,” Klement said. She had brought a small cat carrier to the event, but said she was “still debating” whether to get a kitten. She had two cats for years, both of whom had passed away, she said. By about noon Wednesday, at least one kitten, Hector, had won his way into a permanent home. While the level of excitement about the kittens delighted Hannigan and those she saw out Wednesday morning — “just watch their faces,” she said — she could think of one creature who wouldn’t enjoy the young cats quite as much. “I have an 18-year-old cat and I think I would be pushing it to the max to invite someone else in, darling though it may be,” Hannigan said.